Learn how to customize tax amounts and % rates, use multiple taxes, and get a detailed breakdown of taxes entered. When entering income or expenses, Kashoo shows you the subtotal, tax amounts, and total amounts. If you use multiple taxes, you will be able to see the tax amount attributed to each tax. When you recall a completed income or expense transaction, you will be able to see the breakdown as well as the account that the tax was attributed to. After you add an income or expense transaction, click on either the edit link or select the transaction from the transaction history. You will be able to see where all the taxes are going if you look at the "Summary" and "Accounts Affected" areas on the right hand side. The minus sales tax function is an easy way to calculate the sales tax from a price that includes sales tax (i.e. to assign taxes on a tax inclusive basis). Say you told a client that their invoice would be $100, taxes included (tax inclusive). 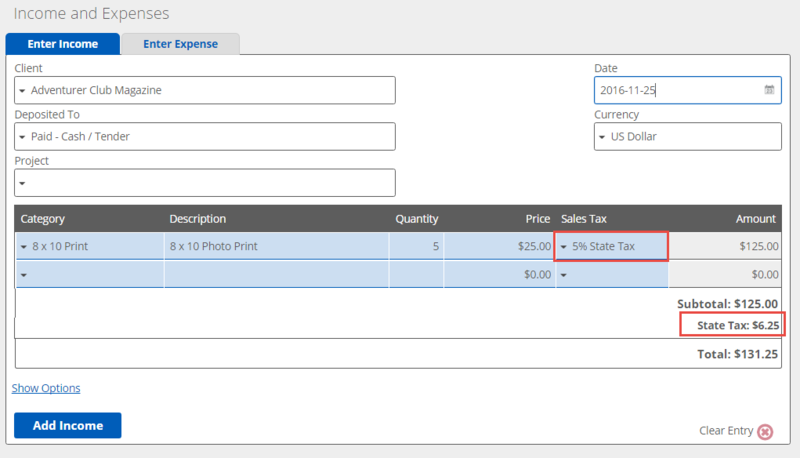 You can simply type in the $100 in the amount column and choose the minus tax, so - State Tax. The subtotal before taxes would be $7.41 and the tax $92.59, for a total of $100. A shortcut code can be used enter taxes faster. For example, the shortcut code for State Tax may be S. So to quickly select the State Tax, you would enter S. We will go through a few examples of entering State Tax and Local Tax, using the shortcut codes S and L.
You can also set up a shortcut code to use multiple tax rates for a single tax or combine multiple taxes. To set this up, please go to the Setting Up Taxes - Advanced article. If you need to adjust the taxes used, custom % rates, and custom $ amounts on a single income or expense transaction, keep on reading below.